"Former Chronic Shin Splints Sufferer Finds A Scientifically Proven Shin Splints Treatment Method That You Could Already Be Using To Stop Your Pain And Frustration Forever!" Permanently In Just Three Days And Helped Thousands Of People Do The Same. My name is Gary Buchenic and for almost 10 years, I suffered from agonizing shin splints, searching for a way to end my problem that caused me frustration and a whole lot of pain. I couldn’t run, play a game of football or go for one of my beloved morning jogs, without aggravating my “suicidal” shin splints. I spent a small fortune on every conceivable treatment available. I spent months seeing an podiatrist on a weekly basis... all with mediocre results. The same thing happened every time. I would follow the treatment to the letter. My shin splints would improve over several days, just in time for my next training session. And when the training session would come, the pain would come back with a vengeance! I couldn’t enjoy my favourite sports because the pain was unbearable. This condition was messing up my life... and driving me nuts in the process! It was a day I’ll never forget – I was going for a jog around the wonderful Albert Park Lake here in Melbourne, Victoria when all of a sudden my knees buckled as a gut-wrenching shot of pain rippled through my shins, and I collapsed in a heap. It felt like a knife being stabbed into the inside of my leg! That experience forced me to develop an overwhelming desire to find a PERMANENT solution to my shin splints. Drawing upon my experience as a personal trainer, I went on a quest for real, practical answers to this condition. I spent hours every day learning everything I could about physiology, anatomy and biomechanics. I spoke to physiotherapists, podiatrists, coaches and personal trainers. I became a man on a mission. I resolved to do “whatever it takes” to get this problem handled and nothing was going to stop me. What does it take to get rid of shin splints once and for all? Step #1: Understand That Pain Is A Desperate Message From Your Body Telling You That Something Is Wrong. In fact, it’s your bodies way of warning you that something is wrong. If you’re suffering from shin splints it’s not a matter of whether you have these problems, it’s a matter of which ones and how many. 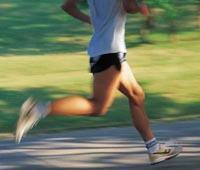 When you address the underlying problems, then you will get rid of your shin splints. Just like a fire can't survive without oxygen to fuel it, you're shin splints cannot possibly persist when these underlying issues are eliminated. So here's the bottom line is... By identifying and treating the specific problems that are causing your shin splints you can get rid of this condition quickly, easily and permanently – guaranteed! 3-Step Plan To Eliminate Shin Splints for Good"
After years of trial, error and experimentation in search of a cure for shin splints, after trying every combination of stretches, exercises and pain relief techniques imaginable, I finally felt I had developed the perfect approach to cure my shin splints. Okay, I have to toot my own horn a bit. It took a lot of work to develop and refine this cure, but it was worth every second and every bit of effort I put into it because it worked. My shin splints are gone and haven't come back in 5 years. That being said, I wasn't sure if what I found would work for everybody... I mean, what if what I found was particular to me and my shin splints? I had to test my method on other shin splints sufferers and make sure it worked for them too. As a personal trainer, finding shin splint sufferers wasn't hard... I quickly assembled a test group and tried my method on them, hoping to help at least 6 or 7 out of every 10 people. Instead, I was shocked by the results. 100% of my test group of 27 people, were cured, and the vast majority saw dramatic relief in just days. When I started the program on August the 10th, I'd just about given up training for the Melbourne Marathon. 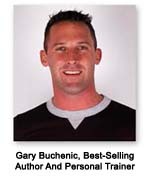 With Gary's information, I was able to get back to regular training - in just two weeks! My shin splints are now gone and I also ended up running the marathon in October which was pretty cool! Thanks for the help, I'd recommend your program to anyone with this problem. "Before I Sat On The Bench And Missed Training. After Using Your Methods I'm The First Choice Striker!" I just wanted to give you a shout and let you know what Stop Shin Splints Forever has done for me. 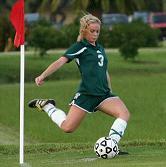 When I started this program my shin splints were so bad I couldn't even train with my team. Now I'm back to being my soccer teams first choice striker, and I'm completely pain free. I can hardly believe the difference 2 weeks on your program has made. I would tell anyone who is looking for the truth about how to really get rid of shin splints, you have found the man to help. Gary has put together the definitive guide on this topic. "My Shin Splints Have Disappeared Completely!" I wanted to let you know that since I've implemented your Stop Shin Splints Forever system my shin splints have disappeared completely. I have suffered with shin splints my entire adult life starting in high school so to say I was frustrated is an understatement. I thought that was how my life was going to be. Thanks to this system I was able to get rid of my shin splints in just 3 weeks. I always suspected there was a 'right' way to do it, I just needed someone to point me in the right direction minus all the BS out there. "The Pain Disappeared In JUST 3 Days!" I had been sitting in the stands for nearly NINE MONTHS. I was on pain killers and iced my shins every day like it was my religion. After being totally frustrated for a cure I came across 'Stop Shin Splints Forever'. I couldn't believe it myself, the gnawing pain in my shins TOTALLY DISAPPEARED IN JUST 3-DAYS! It's over five-months since than and my shin splints haven't come back." "God Bless You For Sharing This Info"
I'm so happy I have found this cure. In just 3 days, the crippling pain I felt in my lower shins whenever I played netball started to subside. When I played a game just 7 days after starting your program, the pain was almost gone. I followed your program for one more week in preparation for the next game. The following game, it was gone for good. It's been 3 months now and my shin splints haven't resurfaced. God bless you for sharing this info! Just a quick note to say that I would not hesitate to recommend your book. I have only used the exercises for 8 days but even after 3 days I could feel the difference. I’ve followed the program instructions to the letter every single day and the results have been amazing... My shin splints that I had suffered from for 12 months have gone completely and I feel my shins are much stronger and healthier now. Thanks Gary and keep up the great work! A Practical Guide To Treating And Preventing Shin Splints Forever, Getting Back To The Sport You Love, And Achieving The Lasting Pain-Free Shins That You Deserve! “Stop Shin Splints Forever” is a to the point downloadable e-book, jam-packed cover to cover with proven shin splint treatment methods, unique powerful techniques and the step-by-step shin splint cure I discovered in over 3 years of research. This book teach you everything you need to know to get rid of your your shin splints quickly, easily and permanently! The proven 3-step method that has helped thousands of people get rid of shin splints for good. Stop Shin Splints Forever is a complete step-by-step method for quickly and effortlessly curing your shin splints, and preventing them once and for all. You will cure the real cause of your shin splints and end your pain permanently! You will get back to the sport or physical activities you love – pain free! It doesn’t matter how severe your shin splints are or how long you’ve had them. The principles outlined in the Stop Shin Splints Forever System to cure and prevent your shin splints are basically the same; these principles have been proven to work and yield outstanding results whether you’ve been suffering for a few months or whether you’ve had shin splints for years like I did. No matter how bad your shin splint condition is... when you finally decide to stop making the same shin splint treatment mistakes that have been holding you back and start applying the techniques in Stop Shin Splints Forever you can literally choose to free yourself from pain and stay free. You will have the power and knowledge to make it happen. 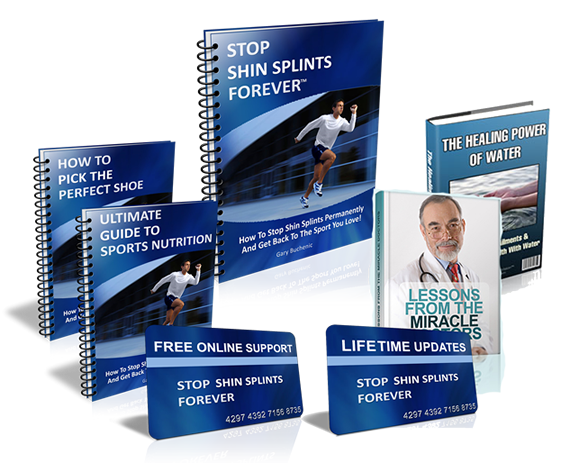 Life is too short to go through years of trial and error when you can – in less than half an hour – read this eBook and master the shin splint treatment methods that took me years of research to perfect. This is exactly the kind of shin splint treatment program I wish I had 13 years ago when I first started suffering from this condition! Learning even one or two of the “little-known secrets” in this guide would have saved me YEARS of pain and frustration! These are secrets people NEVER discover by trying to do it on their own! These are not theories written by some science geek in a white lab coat that has never had shin splints in his life. I practice what I preach and I've used this system myself. Don’t feel bad – you’re not alone. I’ve been there too. I learned how to treat shin splints slowly and painfully, made all the mistakes, tried all the wrong treatments and trusted all the wrong people, I don’t want that to happen to you. That’s why I wrote this program. I have some great news for you! Since there are no printing costs for e-books, you can get this eBook for much less than it would cost if it were a hard copy manual – AND you get it instantly (no waiting for snail mail!) Your investment in this life changing e-book is now only $27.00! You get the Stop Shin Splints Forever e-book containing step-by-step instructions on how to cure your shin splints for life, three bonus reports and FREE life updates – all for just $37.00. Yes, this is a bargain any way you look at it! Even better, if you're not satisfied, send me an email within 60 days and I will refund 100% of your purchase. There is no risk at all! Don't wait a minute to order at this low price! The regular price of Stop Shin Splints Forever will be going up to $67 after this introductory promotion is over. Once you place your order on Clickbank’s secure server, you will be directed to the download page, where you can download your Stop Shin Splints Forever manual and get started IMMEDIATELY. The e-book is in PDF format, which can be viewed on any computer (PC or MAC). You can read it right on your computer screen, or you can even print out your own hard copy. 5 Free Bonuses Worth Over $180.00! When I was first starting on the path to learning how to cure and prevent shin splints, one of the most important things I learned was the importance of choosing a suitable shoe for your foot type, sport and running style. Some people find that choosing the right shoe is all it takes to stop their shin splints... That’s why I’ve written this report so I can share with you exactly how to pick the perfect shoe for you. In this AWESOME report, you'll learn the REAL secrets that pro athletes use to turn every bit of food they put into their mouth into high performance rocket fuel that will send you're recovery times, mental awareness, physical abilities and energy level straight through the roof. 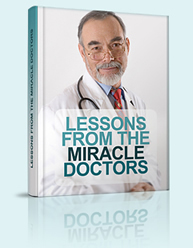 This e-book is filled with over 180+ pages of powerful information and specific step-by-step strategies you can use right now and everyday to get and stay healthy... it's one of the most comprehensive yet easy to read and understand books on the subject of natural health. This is already the most effective and complete shin splint treatment program available. However, I believe in constant and never ending improvement. That's why I'm always testing new things, and refining my methods so that they're even more powerful and easier to follow. And you can be sure that until I get this treatment program absolutely 100% perfect... you'll continue to get updates. I struggled with shin splints for far too long, I know how horrible it can be. 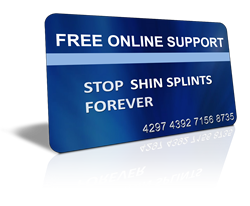 To ensure you get the fast and permanent relief you deserve, for a limited time I'm giving away FREE unlimited online support in case you have any questions after reading "Stop Shin Splints Forever". I'm already answering over 50 emails a day, so I can't guarantee how long I can offer this, so get it while you still can. That's all there is to it. Once you've downloaded your book, read the entire manual from cover to cover. Then take action and start immediately! The instructions and exercises are spelled out in plain English so you can start today in the next five minutes! The results will come - every day your shin splints will start getting better and better and you’ll start getting more and more enjoyment out of the sports you love as your body starts re-balancing itself... After a couple of weeks, you’re shin splints will be completely pain free and you won’t be able to aggravate them if you tried. Best of all, you’ll know the healthy pain-free legs you’ve achieved are permanent and you’ll own the knowledge that got you there. Preventing Shin Splints That Most Sufferers Will Never Know! Look at it this way: The money you invest in this program is a drop in the bucket compared to the amount of money you’d pay for a visit to any respectable medical professional. It’s even less than any good personal trainer would charge for one hour! You have up to 60 days to test and evaluate this course. Use it to the max. If at any point during the next eight weeks you're not satisfied with you're investment in the Stop Shin Splints Forever system, simply contact me and I will return to you every singly penny that you paid. On the other hand, if SSSF helps you permanently eliminate you shin splints, then I want you to e-mail me your success story or product review to tell me about the results you achieved - and tell your friends about it. If you’re even remotely interested in learning the truth about permanent pain-free shins, then you owe it to yourself to at least try Stop Shin Splints Forever. Frankly, this program isn’t for everyone. 95% of the people in this world are going to keep looking for that quick fix treatment or just cross their fingers and hope their shin splints go away by themselves. But I don’t think you would have read this far if you were the type of person to follow the crowd. If you’re one of these special people who are motivated enough to try a real, honest and effective shin splint solution – one of the top 5% who are ready to do what it takes to finally be free of their shin splints then join us and order today, because “just thinking about it” never led anyone to better shins. Right now is your chance to start the path to a shin splint free life. Not tomorrow. Not next week. But NOW! This is one of those moments when you have to take your destiny into your own hands and start doing something that will make a difference in your life... Isn’t it time you tried something that actually works? You’ve found the solution you’ve been searching for. Now do it! P.S. Don't forget, I'm taking ALL the risk... If after following my instructions, you don't get the same life-changing results as I did, I'll refund every penny. What have you got to lose (except for your shin splints)? Try it now! P.P.S. 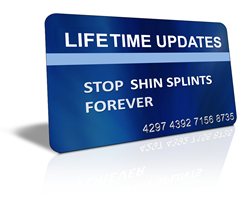 Get the complete Stop Shin Splints Forever program with free lifetime updates for just $27! But you have to order soon because the "Limited Time Special" price can only be guaranteed for a short period of time - Click here to order now and save $40.00! 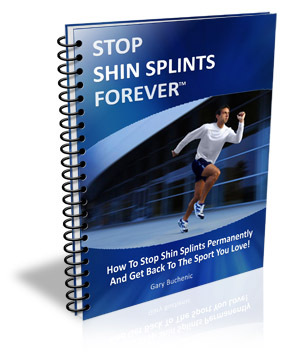 NOTE: Stop Shin Splints Forever is a downloadable manual. No physical products will be shipped. After you order, you will get INSTANT ACCESS to download the manual and all the bonus reports onto your computer. The manual format is adobe acrobat PDF, which can be viewed on Mac or PC. Copyright © Stop Shin Splints Forever. All Rights Reserved.